so as i was researching other ideas than my own for what qualifies as a relationship deal breaker, i made two discoveries. 1. the phrase “relationship deal breaker” is about as over used as Train is overplayed. the leading information according to Google comes from ezinearticles.com, associatedcontent.com and shine.yahoo.com. all are information dumps like Wikipedia only in article form and less credible. every article amounted to “you just did something that annoyed me. we’re over.” one even said if she doesn’t back you up when you do something stupid in public, quit her. really? getting advice from those sites is like allowing Paul Teutul, Sr. to operate on you. eHarmony didn’t do a half bad job, but i still think it missed the mark. for the sake of this blog i will just clarify that i am talking to the unmarried masses. the list of deal breakers for married folk, in my never humble opinion, is short, finite and a blog for another day. there are also others for the dating crowd, but each of those will get its own blog space in the weeks to come. if i had to hit them all at one shot, this blog would be a tome. nobody wants that. so for those still in the painful throes of dating, here are the 4 big deal breakers that made just about every list i researched. pretty sure you don’t need me to define those. they’re kinda huge. and they come with their own Captain Obvious unitard. which is why i can cover them all in one blog. lying and cheating – i am going to lump lying and cheating together. both of these are a betrayal of trust. coming back from either of them to place of healthy relationship is almost like recovering from cancer. it takes a long time of painful treatment and could leave you bald. then there’s always a chance of relapse. i don’t necessarily ascribe to the idea of “once a liar/cheater, always a liar/cheater.” i do think people can change. but she would have to change for herself, not for you, because she wants to be a better person. and you would have to decide if you’re willing to allow her to do that on your time. the thing that you need to remember when you’ve been lied to and/or cheated on is that you are not married yet. you do not have to consider divorce. you can walk away knowing you’ve dodged a 50 caliber round. move on to someone who is more honorable and trustworthy. there are girls who are hot and honest. just ask my pal theo from this blog. abuse – can men be abused by women? hellz yeah. female to male physical abuse is not that common but it is also not unheard of. a friend of mine has the pics of his bruises to prove it. however, the most common form of female to male abuse is psychological. degradation, public humiliation, screaming fits of rage…these all qualify as abusive. if you think about it in reverse, the man would absolutely be considered an abuser if he did these things. women want equality? let’s give it to them. if one of you can give me a good reason to stick around for this, i’ll send you an autographed copy of the book i haven’t written yet. addiction – this one gets sticky. do you abandon someone you care about when she needs support the most to save yourself or do you stay and help her get better? it’s the relationship equivalent of “fight or flight?” i think the answer is both. if she doesn’t want help and isn’t actively pursuing recovery, the answer is flight. just like with liars and cheaters, she’s got to want to change for herself and no one else. you can’t fix her so it’s time to move on. if she does want help and is faithfully attending treatment and/or counseling sessions (in-patient is even better) then feel free to fight for her. however, here’s another kardashian sized but…you do not have to do it as her boyfriend. you can release yourself from that role and just be her friend through the process. if she comes out the other side whole and maintains that for a looooong time, you can reevaluate your relationship. it will give you both time to decide if you actually love the other person, because who she was to you and who you were to her was all filtered through the murky water of addiction. you are both going to look like completely different people on the back side of recovery. which is a good thing. what you’ll have to figure out is if it’s a good fit. it will be almost like starting from scratch. there are certain things that you, as a quality guy, just do not have to take. it does not make you bad person to walk away from a girl who’s busted. expect more. require more. This entry was posted in relationships and tagged advice, blog, dating, funny, humor, marriage, men, relationship deal breaker, relationships, satire, women. so right. those are actually coming up in future blogs. they will either take the form of “deal breaker” or covered in a “glossary of girls” post. Holy cow! I just found your blog from stuffchristianslike.net, and I love it! 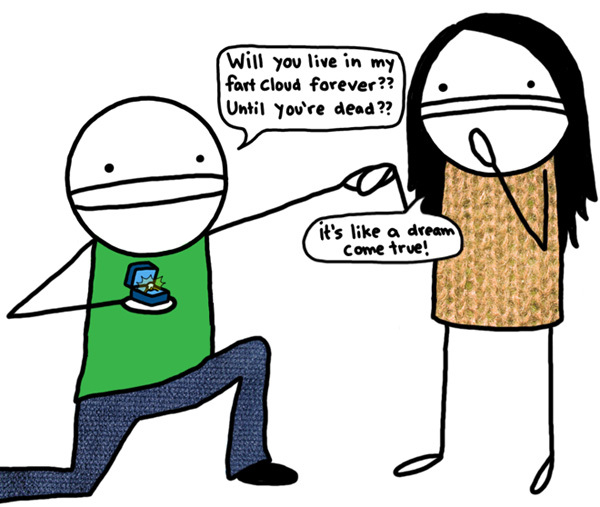 I laughed all day at work today about the “fart cloud” cartoon. I put that one under the “Funny Because It’s True” category. Here is a topic I would love to see you cover, although it may be tricky, because I cannot describe it definitively, I can only give you my gut feeling about the issue. My wife and I were going to learn ballroom dance together (via the ballroom dance club at the university where I am a student), but she backed out on me. Here is where it gets tricky. She has a hundred “reasons”, but I’m pretty sure the real reason is that she is afraid to look foolish in front of people. So anyway, I am learning how to dance, but wondering if it will ever be of any use. I thought women were supposed to wish men would take them dancing. What can I do? I figure if nothing else I can dance with our daughter at her wedding one day and actually know what I am doing. I’ve just found your blog & I’m really enjoying it. i have not, but i am going to Hulu it immediately. and welcome. thanks for finding me. When your significant other gets mad a lot at little things and threatens to end the relationship often if you don’t do something he/she wants you to do, does that count as abuse? BTW, the relationship is over because I got tired of all the fighting. The drawing on the cartoon is almost as funny as what is being said. Nice choice. Stonewallers, too. I married (now ex) a guy who refused to negotiate — just like my Dad! Se: marrying your father. Not necessarily a good thing.